“Rosenthal’s conducting career began in 1934, when he became a percussionist and assistant conductor of the Orchestre National de France, to Désiré-Emile Inghelbrecht. Rosenthal's musical career was interrupted by WWII, when he became a prisoner of war in 1940. Upon his liberation in 1944, he returned to the Orchestre National de France to become their principal conductor, a post he would hold until 1947. In his final year with the orchestra he brought them to join Sir Thomas Beecham and the Royal Philharmonic in a concert that filled the Harringay Arena with 13,500 listeners. His other later posts included music director of the Seattle Symphony from 1948-1951 and music director of the Orchestre Symphonique de Liège from 1964-1967. 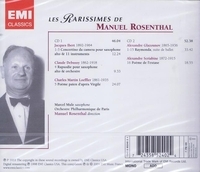 Rosenthal also served as professor of conducting at the Paris Conservatoire from 1962 to 1974.